Got to love a Sale and we have 30% Off all our Fiona and Big clothes, hosiery and accessories on sale Thursday, Friday and Saturday! WOW! That discount is off everything! Not the odd pieces here and there! 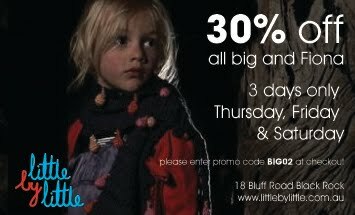 Hurry in store at 18 Bluff Road Black Rock or online at www.littlebylittle.com.au. If you are placing an order online make sure you enter promo code BIG02 at check out.